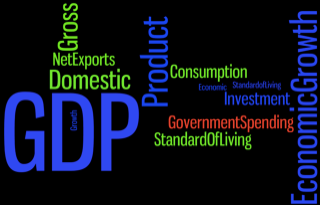 This module began discussion of how to assess the state of the economy using the concept of Gross Domestic Product (GDP), the broadest measure of economic activity we have. We learned what GDP is and how it is measured. We also learned the critical distinction between nominal and real GDP. The sheer size of the U.S. economy as measured by GDP is huge—as of the fourth quarter of 2016, $18.9 trillion worth of goods and services were produced annually. Real GDP informed us that the 2008–2009 recession was severe and that the recovery from that recession has been slow, but the economy is improving. GDP per capita gives a rough estimate of a nation’s standard of living. A key use of GDP is measuring economic growth, i.e. the percentage change in real GDP. We learned that improvements in a nation’s standard of living over time are largely determined by economic growth. We also explored some of the most important factors that contribute to economic growth. This module is the building block for other modules that examine more economic indicators such as unemployment, inflation, or interest rates. Later, we’ll come to see how these economic indicators are related and what causes them to rise or fall.